The following review is brought to you courtesy of Gaga. You see, the very friendly owners of Gaga's happened to stumble upon my post about my lost carton of Gaga's, so they sent over a few coupons to make up for it! How nice of them, especially since the loss was totally my fault! I need to also preface with the fact that they sent these coupons about two months ago, but since I've been shopping at Market Basket on the way home, I haven't been able to pick any up. Well, I was finally at Shaws at lunch and spied the Rainbow SherBetter and realized it was time to correct this issue. 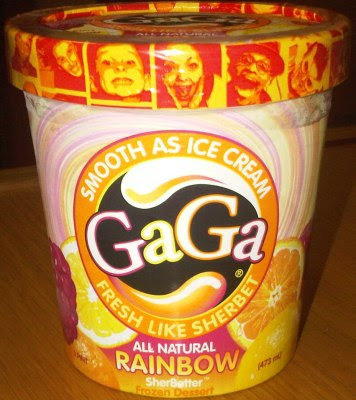 Behold Gaga's "smooth as ice cream - fresh like sherbet" all natural Rainbow SherBetter frozen dessert. It's certainly a catchy looking container plus the rainbow flavor saves me the trouble of having to decide which flavor to try first. It's a mix of their lemon, orange, and raspberry flavors. The only thing not in here is their chocolate flavor (which in my opinion would probably not make for a pleasant combo anyway). 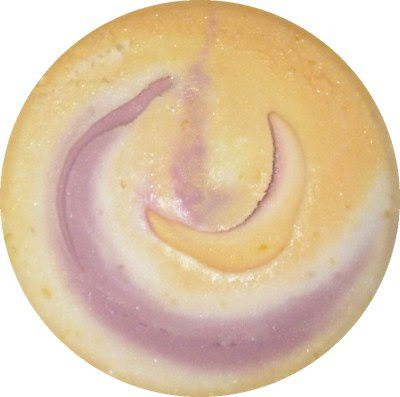 MMMMM, swirls, boy am I hungry!! Where to scoop first? well, i definitely like it, thats for sure. are those little bits of orange and lemon I see?? Nice touch! I dont think I've ever seen that tried before with a lemon or orange flavor. considering that there are three flavors in this pint, the ingredient list is very short and free of funny things that say they are all natural yet have real complex and drawn out names. it's not tart, but it's not overly sweet... well, it's pretty sweet, but in a creamy, milky sort of way. still cant describe the raspberry, it's on the tip of my tongue. the raspberry doesnt have any bits in it. it's not a sweet, jelly-like raspberry, it's definitely more of a (insertwordhere) raspberry. I think I'm actually getting full, and that's quite refreshing really. Nothing worse than sneaking away for a break only to have it be unsatisfying. Let's do a few more bites. I've probably eaten 40% of the container. I definitely get why it's expensive because it's very well made. Ok, time to put this pint back in the freezer. I think I need to classify this treat. I don't think it's really meant for everyone. It's not some cheap party favor (or flavor). It's meant for refined tastes and dare I say more mature palettes. See, I dont want to say that... I'm sure my daughter would eat it, but she'd be just as happy with something that was blue and artificially flavored. If you dig something that is truly all natural, well made, and a bit healthier than regular ice cream, then you should give this a try. Wow this looks really good! I'll have to try this. I saw this at whole foods yesterday. Debated picking it up, but now I'm glad I didn't. It sounds tasty, but probably not enough for the premium price.